I tried not to read too much online about this addictive Dutch novel before reading it. 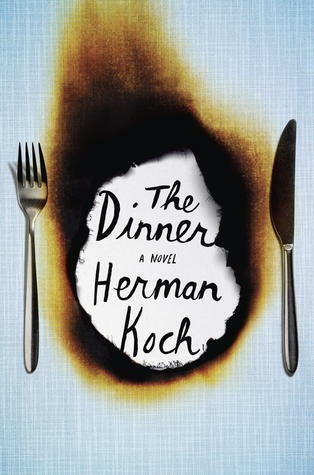 The initial premise was reminiscent of the French play, God of Carnage: two married couples come together for dinner to discuss some mysterious and dreadful incident that involved their sons. The constraint is the dinner with the novel being divided into sections similar to courses–aperitif, entree, dessert, etc. Koch is excellent at presenting a normal activity (dining) that somehow goes suddenly wrong in so many ways. The story is told through the first person narration of Paul Lohman who we come to realize is not as he appears or presents himself. Information and certain character developments are held back until the right time. I wouldn’t necessarily call the latter-time reveals “twists” but they were unexpected and made the story much more gripping and compelling. It was almost as if information was being leaked out and then overflowing more as the novel whisked on. The narration becomes less about the sons’ deeds and more about how Paul Lohman’s past can be attributed to the present. It becomes quite clear halfway through the book that what has already happened even before the incident–in a way–is far more important. Bits of behavior at dinner are dropped in and the order of events that might seem insignificant at first, become key points later on. Koch is really top-notch at crafting this and the translation to English by Sam Garrett seems perfect. I do not know Dutch but I would never in a million years think this was written in any other way than the way the translator presented it. Garrett’s prose makes this feel like a confessional from a reluctant narrator; that we, too, are sitting right there at the dinner table. I also found pleasure in reading about the experience at the high-end restaurant that the two couples find themselves. Paul Lohman prefers the cafe around the corner that serves his favorite spareribs but finds himself unhappily at this lavish restaurant where every moment of the meal is described to him. In the past year, I’ve written and edit a few restaurant reviews for ridiculous “high-end establishments.” I can’t tell you enough how odd and intrusive it is being briefed and bothered at ever turn during an expensive meal. I prefer my service somewhere between “completely ignored by the unsmiling Ukranian waitress in the corner” to “attentive to my water glass.” Koch is able to perfectly find the correct pitch to poke fun at the silliness of these sorts of restaurants. The Dinner was a quick and entertaining read. Make sure not to read too much into the plot beforehand, though. This is Number 6 on The [International] Reading List. Everything about this book if uncomfortable, and all of those details make it memorable. Great pick, and I’m glad that the discomfort sat well with you enough that you enjoyed the book! Definitely. The “unfortunate event” was less of interest to me than all the ways the narrator and the three other dinner guests carried on. Pitch perfect.